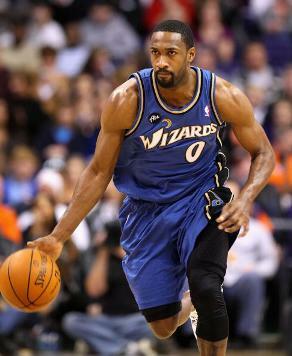 Before the number zero was a favorite among guards in the NBA to wear, Gilbert Arenas wore it to represent all that he came from. His coaches told him he would see zero minutes on the court at the next level. Arenas was fueled by his skeptics. The number reminded Arenas of how far he had come and still how far he had to go to reach his potential. Before Jeremy Lin busted off of the bench to become star in the NBA, Arenas rode the bench for the first 40 games of his career before becoming a star. Every team in the league passed on an opportunity to draft Arenas in the first round of the 2001 draft and the denial motivated him. In his prime, Arenas had more than 2,000 points in three straight seasons, a feat Magic Johnson, Kevin Garnett and Scottie Pippen never reached in a season over their entire careers. Before LeBron James hosted his maligned ‘Decision’ on national television to spurn his hometown Cleveland Cavaliers for Miami, the superstitious Gilbert Arenas made a more interesting, far quirkier ‘Decision’ to spurn his hometown Los Angeles Clippers and current Warriors team for Washington — reportedly because of the results from a coin-flip. Before Twitter brought NBA players closer to their fans on the Internet, Arenas started a blog. He quickly became the most open and accessible athlete the world. Before DeShawn Stevenson became a defensive stopper and three-point specialist for the 2011 Championship Dallas Mavericks, he infamously lost a wager of $20,000 to Arenas on who would make more three pointers out of 100 shots. The catch? Arenas agreed to shoot with only his right hand. What’s more impressive? Arenas still made 73 of his 100 shots. Before Arenas became labeled as a cancer for bringing a handgun into the Verizon Center, he was a role model who donated $100 to local public schools for every point he scored at home over the 2006-2007 season. He was the goofball superstar you wanted your kids to call their “favorite player.” He was a true role model. In 2005, he adopted a child who had lost his parents in a fire. Arenas, himself, had grown up with only his father after his mother abandoned him. He felt the need to be a father figure to the child in need. As time progressed, though, it became harder to be Gilbert Arenas. The fun and lovable man affectionately known as “Hibachi” lost his sizzle on the court. The Wizards fired his head coach and role model Eddie Jordan. Then Wizards’ owner Abe Pollin, a man Arenas had grown very close to while in Washington, died. Later, Arenas found out his estranged mother passed away before he ever got the opportunity to forgive her for abandoning him. Arenas took a final hit when he and his longtime girlfriend broke up. Next thing Arenas knew, he was no longer considered the jovial role model for children everywhere. He was a felon for bringing a gun into the Verizon Center. As Arenas currently sits on the outside of the NBA circle, one can’t help but feel sorry for the man. After all, the full story of what transpired on Christmas Eve 2009 in the Verizon Center is still unclear. For involving himself with a troubled teammate, Arenas tarnished his name as a role model and teammate. The thing is, Arenas is still a role model and class act teammate. Despite being released on Dec. 9 by the Orlando Magic, Arenas still keeps in touch with his former teammates such as Dwight Howard and Jameer Nelson –— two players who expressed deep frustration over the release. Arenas still makes it his mission to mentor John Wall as he was assigned to do in Washington before getting abruptly traded. As the most relatable player to Jeremy Lin’s story, Arenas has also given Lin several phone calls advising him on how to deal with newfound fame. Arenas still yearns for the opportunity to prove his worth again. Since last season, Arenas has matured. He has recently shed 20 pounds, making himself leaner than he’s been in years. Arenas also took the time off from the NBA Lockout to go to Germany to receive blood infusion procedures. He has cancelled his blog and Twitter page to clear his mind of the public’s opinion. But most importantly, Arenas has grown comfortable with who he has become. Arenas accepts that he is no longer a superstar in the league. He is simply excited to help any team in whatever role he is assigned. Despite his nagging injuries over the past few years, Arenas is still only 30 years old. He is also healthier [Marker] than he has been since his prime. If Arenas truly feels as good as he says and looks, a team in the NBA should hustle to sign him. After all, Arenas is a professional at using rejection as motivation to prove his doubters wrong.